December 7, 2018 January 14, 2019 ~ Mike K.
Play if… you feel like you’d be able to keep it together after a natural disaster. Avoid if… clutter makes your OCD go haywire. This room will blow you away. Guess who forgot to put a first-aid kit in the storm shelter? Yep, that would be you. You and your team have suffered injuries from the first storm and need medical attention! Find a first-aid kit to patch yourselves up before you exit. It would be a real shame if the storm shelter became your tomb. Staging Area: there is a small lobby that is located just outside the Game Masters’ control center and next to a hallway that leads to all of their rooms. Plenty of seating for small parties as they wait to enter the rooms. Metro Access/Parking: there is a large parking lot outside, so drive away! Description of the room: You enter your house, which has been decimated by a previous tornado. Things are strewn everywhere and walls have even collapsed. How will you find what you need and escape before the next tornado hits? Understanding of the Mission: pick your way through your destroyed house and escape before the next tornado hits. We (Alex, Mark, Dylan, Erin, Mike and Heather) escaped the second tornado! I was up in Pennsylvania (where my family lives) with Heather to visit family for Thanksgiving. Naturally, I wanted to find a good room to do, so I checked around the area. My younger brother and sister-in-law, and their friends were game to do a room too. There are not a ton of places close to Pottsville, PA, but we were willing to drive a bit. I selected Can U Xcape because the Tornado room sounded pretty awesome, and I was intrigued by the bonus missions. After checking with the owner/manager, Russ, who invited us in to play, we booked the spot and did the hour drive to work off some of those Thanksgiving calories. He did also mention that the room was one of their newer rooms and they were in the process of tweaking it, so it was about 10% harder than they originally anticipated (and that they like to build rooms for enthusiasts). Challenge accepted! While this story is a common one among other tornado rooms we’ve heard about (escape before the tornado hits), there is a nice twist to the story saying that you’ve already been through one, and God apparently hates the fact that he missed you with the first one so that you’re now going to have to figure out how to survive a second one less than an hour later. The mission is relatively simple: find a way to escape your destroyed house before the second tornado hits. HOWEVER, this location gives you a bonus mission to play on top of your original objective (completion of the bonus mission also removes 3 minutes from your final time). You were injured in the first tornado, so you have to find the hidden first aid kit. I enjoyed the additional challenge of the bonus mission, which added some challenge to the overall mission, and it was pretty tough. I can see why there is only a 15% success rate in completing that part of the mission. Note: we did NOT complete the bonus mission… we were about 95% of the way there, and elected to escape the house and earn the time for the room itself (which was about 3 minutes better than the current record at the time). This was a pretty great room in terms of the diversity of the puzzles and types of locks we encountered. There were a number of combo locks, but they fit the theme of the room and weren’t unexpected. I saw some awesome new stuff here that required some keen observation, and then application to another puzzle that required some additional deduction. Heather actually spent most of the time on this puzzle and I helped her out with the last 20%. It was kind of satisfying to see this one completed. There is a part in the very beginning that will challenge your communication skills as a team. I will only say that when you are asked for volunteers, choose a person/people who can communicate and who have done a number of rooms before. I did see some things here that I’ve seen elsewhere (different takes on those puzzles, obviously) but they were well done and still required some time to figure out. 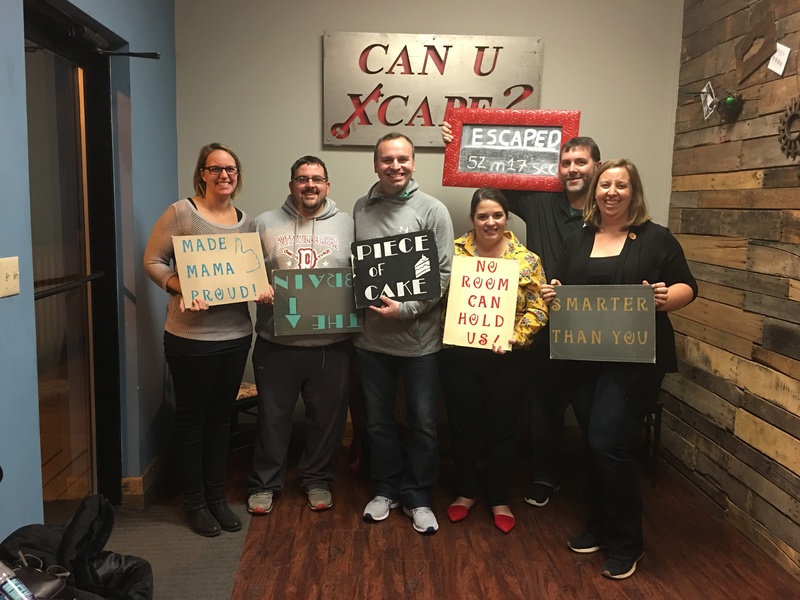 One puzzle in particular I was glad I’d seen a take on elsewhere because I don’t know if my team of 2 Escape Room Virgins (ERVs), and 2 Escape Room Newbies (ERNs) would have figured it out, or as quickly. Other than that… as the resident “expert,” I kinda floated around to where everyone was working so I could help out or direct them on what to do. Erin, for example, was experiencing her first room. We started on a puzzle together and I let her complete it after we got about 30% of the way through. Some great tech in the room too besides the combo locks, which was great to see the ERVs and ERNs react when we triggered the openings. Overall, there was a good mix of really complex puzzles (i.e. the bonus mission, which we were told Heather figured out the first part of it the fastest among all the other teams who had been through the room) and some ones we solved pretty quickly. This worked well for our group because Heather and I have done a lot of rooms, while Erin and Dylan were experiencing their first, and Mark and Alex had done a handful, so everyone was able to find a way to contribute. Some of the puzzles were pretty complex in the fact that you had to gather the info throughout the experience and locations and then figure out how to apply them to the overall solution. So, this was pretty awesome in my estimation because it really ties the room together (versus a room where you find something and immediately open a lock, and then that’s how it goes for the whole experience). I would say that none of the puzzles (except the bonus mission) were overly complex… maybe a 7 out of 10, but the bonus mission… wow… I spent about 7 minutes on that and didn’t get anywhere, while Heather deduced it in about 2 minutes). We did get hung up twice and asked for clues. The second clue was needed because the puzzle could be taken in two different ways. We just read it wrong and went the other direction (Murphy’s Law strikes). The overall flow to this room was really well done… you all start off and can work (almost required) independently or in small teams, and then a lot of communication is required as you find things around the room and throughout the experience. It really fits because your house was almost completely destroyed, so finding things all over the room that work in other areas really makes sense. Everything pretty much fit with the theme or mission, and the few items you may not see in a standard home can be forgiven because it adds to the overall experience of not having to open up 30 combo locks. I did like the final puzzle, even though that’s one we got hung up on, because of how it fit what likely would happen in a tornado. Lots of unique things here and they were fun to puzzle out and put together and there were a few “EUREKA” moments (A-HAs) which added to the experience. The decoration of the room was very well done, and the things scattered across the room and how everything looked really led you to believe that you were in a home that had just been hit by a tornado. I had a great time in this room. It was pretty well done and I’m glad that my team of ERVs and ERNs also had a great time. I’m pretty confident that more escape rooms will be in their future. Our GM was pretty great. She saw at one point that we had searched and area and directed us back there because we needed to search a bit better (we didn’t do a “full” search because in other rooms, you’re told specifically not to take this particular action). So, that was very much appreciated. We asked for help twice, and the first time the info was immediately helpful. The second time it took us more than a few minutes to figure out what we were doing wrong (we had completed the puzzle correctly, but didn’t apply certain factors of the puzzle in the right way). Final Thought: I was really pleasantly surprised with this experience at Can U Xcape, not knowing anything about the location or the themes other than what I read on the website. I would say that this is a room that enthusiasts will enjoy, and newbies as well if they did the max in the room so they could put more eyes on everything. Definitely looking forward to going back and checking out the other two rooms (they suggested the Submarine room fo rate next time). However, Tornado was a great experience and I’m glad that two of my team had this one as their first room.